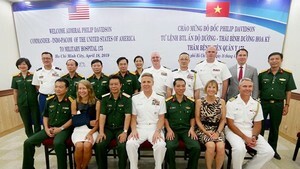 Speaking at an opening ceremony if a training course about “ Consultation on inheritance and reproductive 2019” organized by the Ho Chi Minh City Medicine University Hospital yesterday, physicians said Vietnam is one of countries with high rate of infertility according to the World Health Organization’s figure. According to participants, in the 21st century, as per the World Health Organization’s statistics, infertility ranks the third dangerous ailment just after cancer and heart diseases. According to Vietnamese Ministry of Health, infertility rate currently stands at about 7.7 percent of Vietnamese couples in children bearing age. Worse, the number of children having genetic disorders and innate deformities is large. Annually, 1.5 million Vietnamese babies are born including 1,400 – 1,800 of them suffering Down syndrome; 200 - 250 of them suffering EdWards syndrome; 1,000 – 1,500 suffering neural tube defects and 2,200 with Thalassemia. In the framework of the training course, reports focus updates of applications of inheritance methods in reproductive assistance. The meeting saw the participation of more than 200 local and international scientists and medical workers.